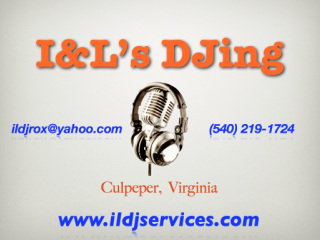 "At I&L's DJing, located in Culpeper, Virginia, it is our mission to provide tasteful, professional DJ services along with great customer service between clients and guests from the start to the finish of an event. In doing so, this ensures that everyone has a great time at all of our events and everyone leaves satisfied with the music selection. We arrive plenty of time in advance to set up, and we perform continuously throughout the event. We guarantee that you will not be disappointed with our renowned top-rated services." "A DJ can make or break a party. Here at I&L's DJing, I strive to exceed your expectations and requests. I have been a DJ for over 10 years, and our sound engineer has over 30 years of sound mixing under his belt, ensuring that everything sounds great from start to finish. From our state-of-the-art lightshow, to our digitally enhanced audio systems, I guarantee you will not be disappointed. Each and every one of our events is a unique experience for both you and your guests. We easily accommodate events of all sizes, big or small. We tailor our setup to best suit the venue for your event. From birthday parties, Sweet 16's, and school dances, to corporate functions, and especially weddings, I&L's DJing has you covered with the appropriate music selection and any announcing that may be necessary." Worried if your DJ is going to have a song you would like to request? With I&L's DJing and along with the help of modern technology, worry no more. We feature a service called Download On Demand. At any location where a standard cell phone connection is available, we have the ability to access online databases which allows us to acquire virtually any song in which we may not already have in our extensive song catalog.